A big HIC card took place on October 15, 1969 which marked the first title of the New North American Champion Curtis Iaukea, a return match between The Sheik and The Missing Link, and a fight to the finish between Ed Francis and Ripper Collins. Prior to the main event, four other matches took place. 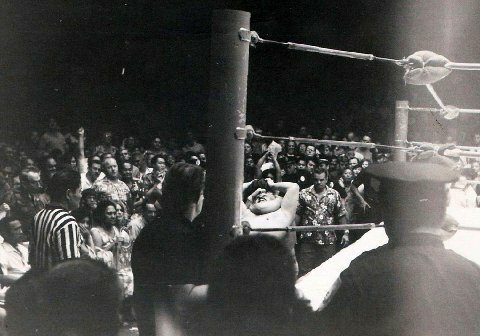 The first match saw Odd Job Tosh Togo battle to a draw with Karl Gotch, Pedro Morales and Hahn Lee defeated the team of Stan Nelson & The Alaskan, who took the place of The Crusher, who was unable to make it to Hawaii. 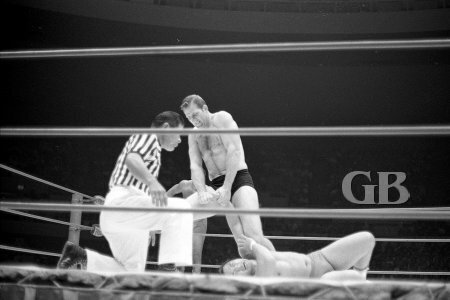 Karl Gotch applies a leg scissors to Tosh Togo's head. Pedro Morales about to body slam the Alaskan. 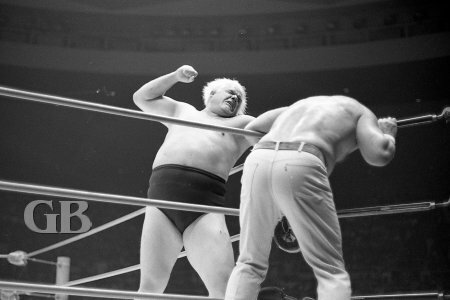 Stan Nelson cranks up the pressure on Hahn lee's arm. Hahn Lee smacks Stan Nelson with a vicious Flying Tackle. 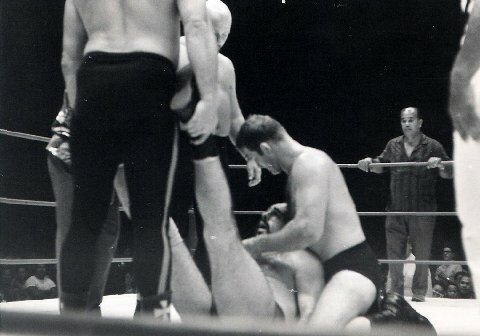 Stan Nelson and The Von Steiger Brothers assist in removing The Alaskan from the ring because Pedro Morales refused to wake him up after applying "The Sleeper Hold" on him. 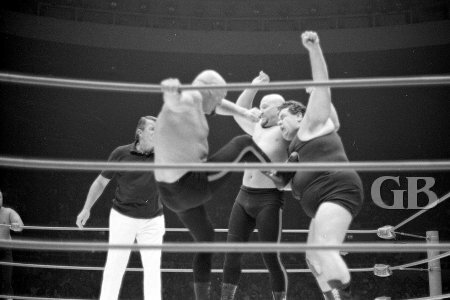 In another tag team match, The Von Steiger Brothers defeated the team of George Harris and McRonald Kamaka. 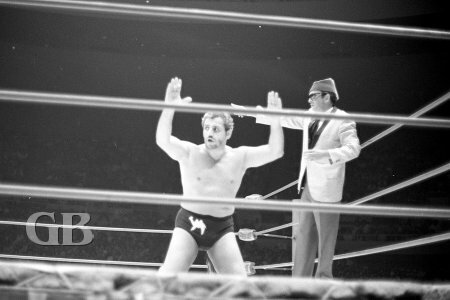 Curtis Iaukea retained his North American title by going to a draw with Ray Stevens. The Von Steiger Brothers team up on George Harris. 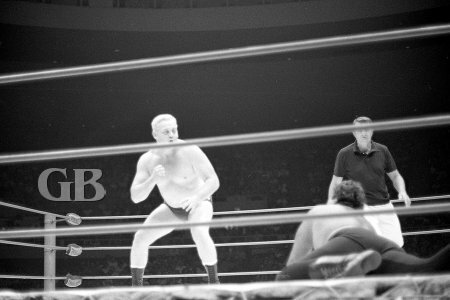 Pete Peterson starts the count on Stevens and Iaukea. 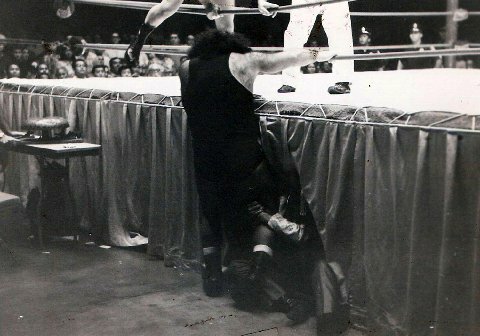 Ray Stevens confronts a fallen Curtis Iaukea. Stevens sends Iaukea flying with a Back Flip. 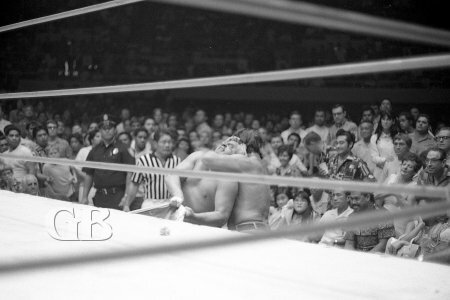 Ray Stevens sees an opening and goes in for the kill against Curtis Iaukea. 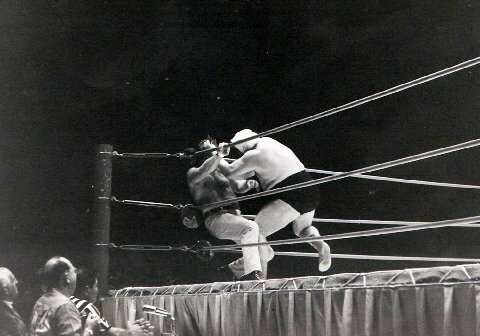 The first main event was a rematch between The Sheik and The Missing Link from a month earlier where The Sheik was disqualified for attacking both The Missing Link and referee prior to the match. The match was 2 out of three falls to a television curfew. As soon as the match started, The Missing Link attacked The Sheik, after 6:48 of action, The Sheik gouged The Link's eyes and pinned hm for the first fall. The second fall lasted only 1:15 when The Link applied the Claw Hold on The Sheik, who quickly submitted thus evening up the match. 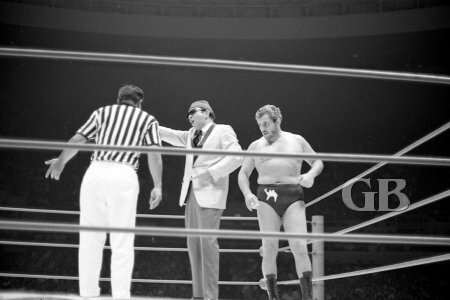 Referee Wally Tsutsumi, the Sheik's manager The Weasel, and The Sheik himself. The Sheik gets down on his prayer mat before each match, as the fans boo. The Sheik about to feed on The Missing Link's face. The Missing Link applies a painful Claw Hold on the Sheik. For the third fall, The Sheik threw The Missing Link out of the ring and went after him as The Link tried to get back into the ring. The Sheik then slammed The Link's head into the time keeper's table. Meanwhile, The Sheik's manager (The Weasel) went under the ring and held onto The Link's leg as he tried to get back into the ring. 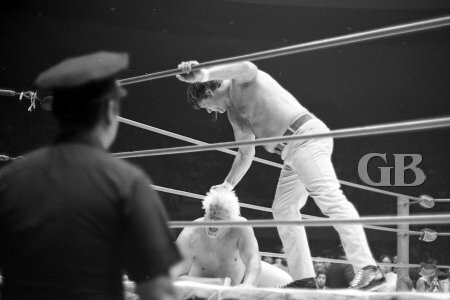 Referee Wally Tsutsumi started to count to 20 and The Link was counted out and the match was awarded to The Sheik. After being counted out, The Missing Link reache down and pulled The Weasel off him and picked him up by the neck. The Sheik seeing this attacked The Link and left him laid out on the floor of the arena. The Missing Link struggles to return to the ring while the Sheik's manager, "The Weasel," holds him back from under the ring. 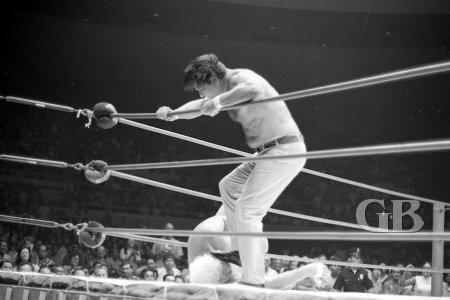 As The Sheik was leaving the ring, all of a sudden Pedro Morales came running towards the ring and as he approached, The Sheik reached into his trunks and threw a fire ball at Morales' face and Morales fell to the ground. 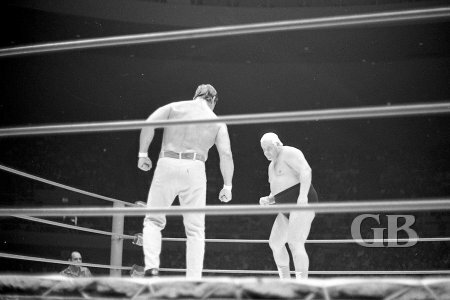 Next, The Sheik approached Lord Blears, who was narrating the match on KGMB TV, and once again reached into his trunks and threw a fire ball at Blears, then left for the locker room. 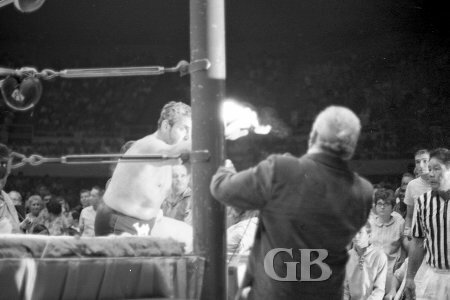 The Sheik throws fire in the direction of commentator Lord Blears. The final event for the evening was a non-sanctioned fight to the finish between Ed Francis and Ripper Collins with no time limit, no disqualification, no rules, and no referee. Since this was a non-sanctioned match, the crowd was given five minutes to leave the arena; as expected, no one left. Both wrestlers stalk each other looking for an opening. Ed Francis pulls up Collins by the hair. Collins pounds away at Francis in the corner. Collins delivers more punishment to Francis in the corner. Collins slams Francis in the corner. Collins punches Francis in the corner. As both men entered the ring, all hell broke loose. The match was nothing but punching, biting, gouging, with both wrestlers hitting each other's head into ring posts and tables around the ring. 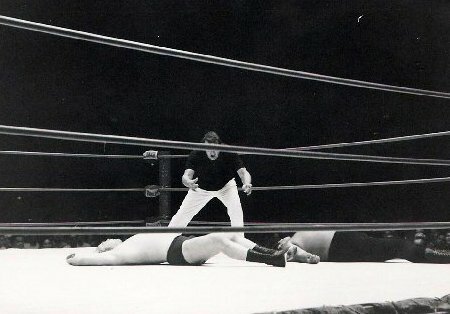 The match went on for several minutes and soon Collins was bleeding from the head and Ed Francis got his sleeper hold on him outside the ring. Within a minute, Collins was asleep to the delight of 8700 fans. Francis continued to stomp on Collins, who was asleep on the floor of the HIC and was pulled away by Lord Blears. Finally, Collins was carried to the locker room on a stretcher and Francis was declared the winner of the match. 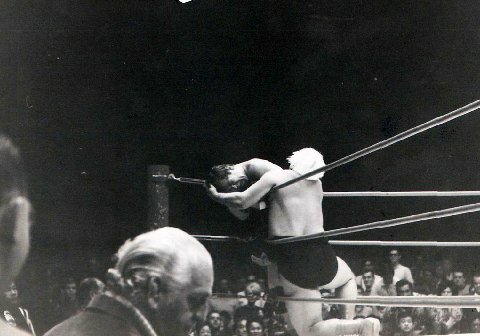 Francis applies "The Sleeper Hold" on Collins outside the ring. Ed Francis has his Sleeper Hold locked on Collins outside the ring.